Summer’s here and for some that signals taking up a new sport or hobby, typically something that involves the outdoors like cycling. Well, for those who are inclined to bike this summer, do it safely with Blade’s new line of safety gear. The country’s one-stop shop for anything automotive is now introducing its own like of bicycle safety gear for those who prefer pedal power to petrol power. Made of impact-resistant PVC and EPS plastic, Blade’s line of cycling helmets are lightweight and come with adjustable cross strap buckles. There’s even one version that’s officially licensed from Italian supercar maker, Ferrari. Aside from bike riding, these helmets can also be used for roller skating and skate boarding. They’re also quite affordable with prices that start at P 499.75 to just P 799.75 for the carbon fiber finished one. 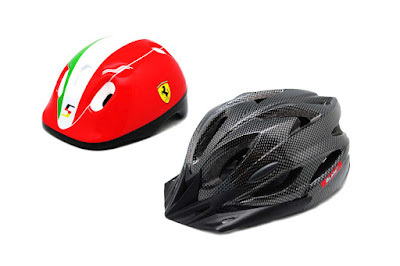 “Helmets are a necessary equipment for outdoor activities such as cycling. We at Blade promote fun and safety cycling by offering these affordable and proven helmets,” says Albert Go, Marketing head of Blade. Blade Auto Centers are located strategically at SM, Ayala, and Robinsons Malls nationwide.